'Uncertainty' is by far the largest term floating around in the forecasters' word cloud for 2017: uncertainty affecting consumer spending, uncertainty hitting employers' recruitment intentions and pay settlements, uncertainty hitting investment. Yet, as far as UK consumers are concerned, one thing we can be certain about is that the state of the employment market is absolutely central to whether they carry on spending. It determines their biggest source of income, wages, and via the rate of unemployment it affects their confidence and hence their propensity to spend. And wages, until now, have been a very positive influence, contributing as much as 3.8 percentage points to growth in 2016 Q2 and making them one of the reasons why, given a lag of between one and two quarters in affecting behaviour, consumer spending growth was so strong in autumn 2016. 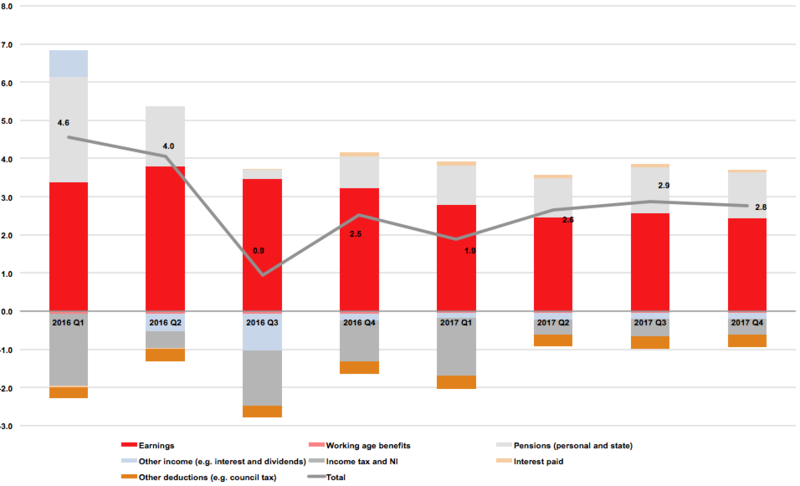 In Q3 they were nearly as strong a contributor, but a big hike in government national insurance and tax take and an unexpected slowdown in pensions payments received, meant net income growth slowed to just 0.9%. The final quarter, according to data so far available for tax and wage growth, suggests a better net income growth of 2.5%, but overall, it is pretty much baked in that consumer spending will slow significantly in the first half of 2017. Add in a further slowing in wage growth, the beginnings of a rise in unemployment as companies hold back from job creation and the effects of inflation at over 2.5%, and real terms growth in consumer spending in the second half of the year could be close to nil or slightly negative. What could change all of this? Well, it's the jobs market. The core ConsumerCast forecast follows the Office for Budget Responsibility in predicting slowing wages and rising unemployment as uncertainty affects employers' confidence. However, some employment surveys (Markit, CIPD) suggest this is not the case and point instead to a jobs market that was actually strong and buoyant at the end of 2016. With UK unemployment at 4.8%, close to its lowest rate in over a decade (it briefly hit 4.7% in summer 2005), it would not take much of a tightening in the market to provoke an acceleration in wages as employers seek to combat much vaunted 'skills shortages' (usually just a shortage of labour at the particular wage that they are willing to offer). Take away the assumptions of both slower wage growth and higher unemployment and the scenario is very different, with consumer spending increasing at 3.5% to 4.0% in nominal terms as income from employment grows healthily and confidence remains high. In real terms, growth may slow, but it will still be present, at least for favoured groups like the over-50s and middle to upper income brackets. The next set of official unemployment and earnings figures, covering November, is due out on 18 January. The last figures showed an apparent slowdown in hiring but an acceleration in wage growth. Which way the latest statistics show the UK jobs market is heading will be a crucial pointer for the outlook for consumer spending, including retail, in 2017.